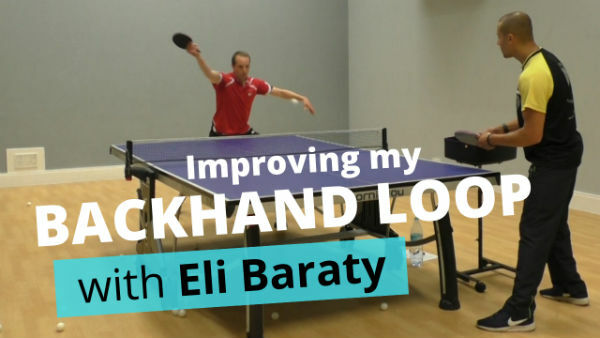 In this video I ask top coach Eli Baraty to help my improve my backhand topspin. My backhand loop has been driving me crazy! I can do it in practice (most of the time), but rarely use it in a match situation. So I got together with top coach Eli Bararty to solve my problem. In the video Eli takes a look at my technique and gives me tips on how to use my legs and wrist to get more spin and consistency. He also gives some advice about using the shot in a pressure situation. 0:12 – Eli demonstrates backhand topspin vs backspin. 0:30 – Tom explains the problems he has when playing backhand topspin vs backspin. 3:41 – Eli gives feedback on how Tom needs to change his mental approach. 4:45 – Final thoughts from Tom about the coaching session.